About the Study | California Trout, Inc. The foundation of State of the Salmonids II: Fish in Hot Water is based on 32 rigorously researched, peer-reviewed biological and ecological species accounts prepared by Dr. Peter B. Moyle, Patrick J. Samuel, and Dr. Robert A. Lusardi. 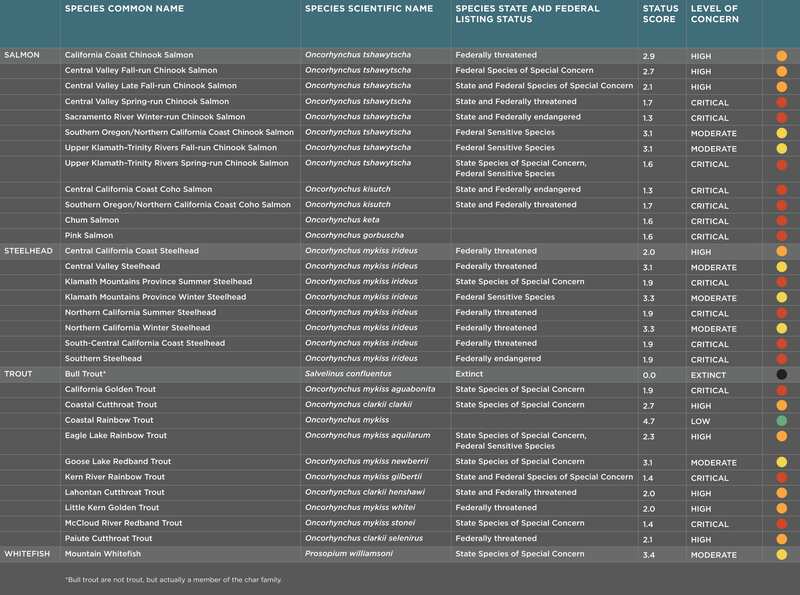 Each account has been externally reviewed and is published as Salmon, Steelhead, and Trout in California: Status of Emblematic Fishes, Second Edition. This is the second State of the Salmonids report, the first of which was published in 2008. This second edition is timely. During the writing of the first edition of the State of the Salmonids report in 2008, the commercial salmon fishery was closed due to low adult returns. Each year since then, the fishery has been restricted or constrained in some way. At the writing of the 2017 report, the commercial salmon fishery is again closed for the season. The northern part of the state is emerging from historic drought (2012-2016), which saw significant negative impacts on salmonid populations and juvenile survival. Further, new information, especially in the form of federal and state agency reports, and genetic and life history research that was not available before have been published, helping to paint a clearer picture of the true plight of California’s salmonid populations. While California’s climate, precipitation patterns, and trends in salmonids has changed, monitoring efforts, especially for species not listed under the Endangered Species Act, remain insufficient. To view the full scientific report, click here. To access a downloadable version of SOS II: Fish in Hot Water, click here. What does the loss of California's salmon, steelhead, and trout mean? Loss of California’s salmonids means a global loss of diversity. In 2015, our partners at Trout Unlimited released the State of the Trout report, which provided a broad overview of the status, trends, and threats facing the trout species across the United States. While that report provided a general overview, this report dives more deeply into the status and trends facing all of California’s salmonids at the southern edge of their range. Status reviews are needed more frequently to alert managers and others on changes in the trends of the salmonids across California. While considerable efforts were made to compare the results of this second edition with the first edition of the State of the Salmonids report (2008), the level of information available for most species has greatly improved, as has our understanding of the threats they face and their impacts on salmonid populations. As a result, our current effort uses vastly improved metrics to portray what we feel is a considerable improvement in the quality of the status assessments for each species. 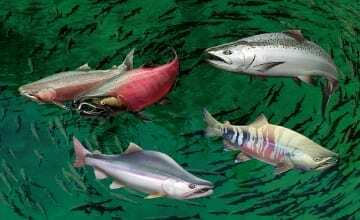 This report will alert agencies, stakeholders, and the public to the potential extent of the problem with declining salmon, steelhead, trout and their waters in order to encourage strategic conservation, especially in the face of climate change. In fact, the decline of California salmonids is a problem of national significance. Because of its complexity, California produces conditions similar to conditions throughout the range of salmonids, but its southern location and extreme development of water resources means the state’s problems presage those of other areas. Loss of California’s salmonids means a global loss of diversity. 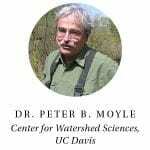 Peter Moyle is the Distinguished Professor Emeritus in the Department of Wildlife, Fish and Conservation Biology and Associate Director of the Center for Watershed Sciences, at UC Davis. He is author or co-author of more than 240 publications, including the definitive Inland Fishes of California (2002). He is co-author of the 2017 book, Floodplains: Processes and Management for Ecosystem Services. His research interests include conservation of aquatic species, habitats, and ecosystems, including salmon; ecology of fishes of the San Francisco Estuary; ecology of California stream fishes; impact of introduced aquatic organisms; and use of floodplains by fish. 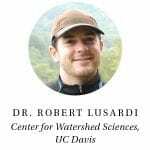 Robert Lusardi is the California Trout/UC Davis Wild and Coldwater Fish Researcher focused on establishing the basis for long-term science specific to California Trout’s wild and coldwater fish initiatives. His work bridges the widening gap between academic science and applied conservation policy, ensuring that rapidly developing science informs conservation projects throughout California. Dr. Lusardi resides at the UC Davis Center for Watershed Sciences and works closely with Dr. Peter Moyle on numerous projects to help inform California Trout conservation policy. His recent research interests include Coho salmon on the Shasta River, the ecology of volcanic spring-fed rivers, inland trout conservation and management, and policy implications of trap and haul programs for anadromous fishes in California. Patrick Samuel is the Conservation Program Coordinator for California Trout, a position he has held for almost two years, where he coordinates special research projects for California Trout, including the State of the Salmonids report. Prior to joining CalTrout, he worked with the Fisheries Leadership & Sustainability Forum, a non-profit that supports the eight federal regional fishery management councils around the country. 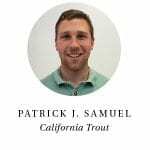 Patrick got his start in fisheries as an undergraduate intern with NOAA Fisheries Protected Resources Division in Sacramento, and in his first field job as a crew member of the California Department of Fish & Wildlife’s Wild and Heritage Trout Program.